2. Sturdy and attractive.it's sturdy and durable.it enable to stand winds with your hanging plants on it. Sturdy: Rust resistant, heavy duty steel construction. The total weight on the brackets not to exceed 5 kg or 11 lbs will be best. Metal Plant Bracket will matches perfectly in outdoor and indoor settings and add charm to your surroundings. MULTI-PURPOSE: Beautify your home or garden by hanging bird feeders, lanterns, planters, flower pots, holiday decorations, string lights, wind chimes, ornaments, candle holders, path lights, and so on! There are 2 option for hanging distance. Easy Install: Our Plant Hanging Brackets comes with screws that are right for most applications.But it is also easy to substitute longer screws by yourself if you think you need it. You can mount it on wall, deck, fence, door for indoor or outdoor events in living room, garden, garage or balcony. Attractive: Attractive brackets for a rustic style garden. A black finish stunningly complements anything that hangs from it, adding elegance and beauty to your home or garden.Looks great within a variety of different environments. Curved tip helps securely hold items while adding to the exquisite look. 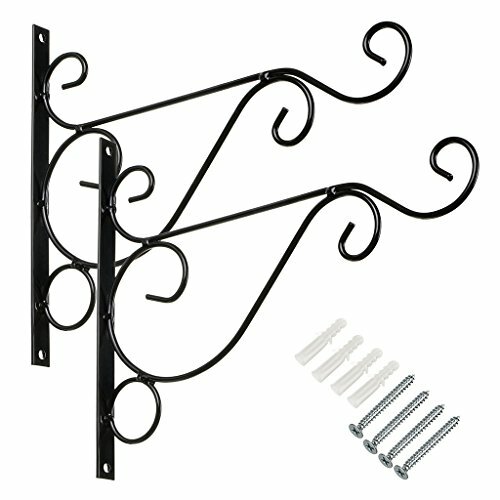 Package includes 2 hooks with 4 mounting screws. Approx. dimension: 10 1/5 x 8 1/5 Inches. This Plant Hook will easily hold your flower basket, bird feeders and other accessories. Please kindly check the size and loads before you purchase. Any problem, please send us the email and let us know.